Working as a flight crewmember can put a pregnancy at risk, particularly during the first trimester, notes the National Institute for Occupational Safety and Health (NIOSH). NIOSH points to three hazards that could imperil a pregnancy—circadian rhythm disruption (jet lag) or shiftwork, physical job demands, and cosmic ionizing radiation. While pregnant workers in many occupations do shiftwork and heavy lifting, exposure to high levels of cosmic ionizing radiation is probably an occupational hazard that is unique to flight crews. The problem for pregnant flight attendants is that it cannot be avoided while flying. Cosmic ionizing radiation comes from outer space with a very small amount reaching the earth. At flight altitudes, passengers and crewmembers are exposed to higher levels on every flight. The World Health Organization says that ionizing radiation causes cancer as well as reproductive problems, but NIOSH believes the issue warrants additional study. Despite these reservations, NIOSH does not dismiss the risk. For example, one NIOSH study found that exposure to 0.36 millisievert (mSv) or more of cosmic radiation in the first trimester may be linked to an increased risk of miscarriage. If this estimated is accurate, the risk to flight crewmembers is high. The National Council on Radiation Protection and Measurements report that aircrew have the largest average annual effective dose (3.07 mSv) of all U.S. radiation-exposed workers. Other estimates of annual aircrew cosmic radiation exposure range from 0.2 to 5 mSv per year. There are no official radiation dose limits for aircrew in the United States; however, there are national and international guidelines. For example, the International Commission on Radiological Protection (ICRP) recommends a dose limit of 20 mSv/year averaged over 5 years for radiation workers and 1 mSv/year for the public. For pregnant radiation workers, the ICRP recommends a dose limit of 1 mSv throughout pregnancy. The National Council on Radiation Protection and Measurements has a 0.5 mSv recommended monthly radiation limit during pregnancy. Flying through a solar particle event doesn’t happen often; pilots fly through about 6 solar particle events in an average 28-year career. Still, a pregnant crewmember who flies through a solar particle event can receive more radiation than is recommended during pregnancy by national and international agencies. Also, avoiding exposure to solar particle events is difficult because they often happen with little warning. One helpful resource is the National Aeronautics and Space Administration’s (NASA) Nowcast of Atmospheric Ionizing Radiation System ((NAIRAS), which was developed to report potentially harmful flight radiation levels to flight crews and passengers. Try to reduce time working on very long flights, flights at high latitudes, or flights over the poles. Calculate usual cosmic radiation exposures. The Federal Aviation Administration has developed a tool to estimate the effective dose from galactic cosmic radiation (not solar particle events) for a flight (https://www.faa.gov/data_research/research/med_humanfacs/aeromedical/radiobiology/cari6). If pregnant or planning a pregnancy, consider work exposures, including cosmic radiation. If pregnant and aware of an ongoing solar particle event when scheduled to fly, consider trip-trading or other rescheduling actions if possible. More information on the risks of cosmic ionizing radiation to pregnant flight crewmembers is at https://www.cdc.gov/niosh/topics/aircrew/reproductivehealth.html. n fact, documents obtained through the Freedom of Information Act (FOIA) process reveal that NRC employees had already determined the study would show no impact. Internal emails indicate that staff was presupposing a conclusion for which they had no evidence, demonstrated by statements like “even if you found something that looked like a relationship [between cancer and radiation], you wouldn’t know what to attribute it to,” and “[m]ost people realize that all the evidence shows you’re not going to find anything.” The evidence, however, had not yet been fully collected and examined. NRC exposure data and modeling is designed to demonstrate compliance with the NRC’s regulations but not to assess health impacts. The NRC has already stated numerous times that it believes low doses of radiation, the kind NRC claims its licensees are allowed to release, pose risks so low that health impacts may not be discernible. We don’t know if NRC’s claims of no discernible or attributable public health impact from nuclear power are actually true since no one has ever looked properly. Studies in other countries show association between nuclear facilities and childhood cancer. However, given the demonstrable bias of the US NRC toward low doses having no health impact, it is essential that a US study go forward under the auspices of outside, independent experts, in order to examine what is happening in the US. Under the original and now canceled study, the NRC had tasked the NAS to use the most advanced methods in order to update the study the NRC currently uses to claim its reactors are safe. That study, published in 1990, had several shortcomings including the way the authors define and examine disease, assumptions about doses, location of cases, and who is examined. The NAS was considering two study designs, one examining specifically children. This study type, dubbed by one expert as a case-control nested in a cohort, is very similar in basic design to studies conducted in France and Germany, which show increases in childhood leukemia around nuclear power facilities. The NRC scuttled the NAS study in 2015, dubiously claiming it would have cost too much and taken too long. Upon examination, however, it is clear that the NAS study would have challenged the fundamentals of the NRC’s health assessment regime. 14, which concentrates in fetal tissue more than maternal tissue. This detailed and accessible protocol could have opened the NRC’s regulatory regime to exhaustive scrutiny, revealing just how inadequate it is for examining health impacts in the first place, never mind protecting public health. Further, with such careful research, NRC could have feared that the NAS study would point to an association between environmental radiation and cancer, as other studies have, although FOIA documents consisting mostly of internal emails did not specifically demonstrate this fear. While the NAS child study design and protocol had much to recommend it, it is unclear whether it would have been free of all of the flaws that have historically plagued radiation health assessments. At the point of study cancellation, independent experts still had concerns. Historically, industry and radiation regulators have insisted that a causal link must be absolutely established between radiation and disease. For protection of the public, however, experts claim the standard should be a lower bar of association with disease. If this study moves forward under the NAS, it needs to relinquish concepts and methods that favor causation. To date, researchers have started radiation health studies by presuming that there will be no impact because doses are too low — a contention that, in reality, remains scientifically unproven. Many studies reveal the opposite. Any new such research needs to ensure that the basis for health assessments is a focus on health outcomes, not dose models that are fraught with uncertainties. While NRC licensees attempt to monitor environmental contamination, the NRC has never incorporated biological monitoring, which might prove useful after spike releases from various facility outages. There are several techniques that have been used in other health studies, which a revived cancer study could weave into any child or adult health assessment. John Urquhart 19th July 2018 Miscarriages and their causes are rarely discussed in public but for many women they are an unfortunate fact of life. To be more precise; for every 10,000 pregnancies, an estimated 3,000 end with a miscarriage. Very few people know that a significant proportion of these miscarriages is due to chromosome aberrations in the foetus, particularly Down Syndrome. Boué examined 1,500 foetuses that had naturally aborted. He found that 38% had Down Syndrome. So on that basis, for every 10,000 pregnancies, 1,114 miscarriages occur due to a Down Syndrome condition in the foetus. On the other hand, the actual number of children born with Down Syndrome is less than 10 in 10,000. Even allowing for therapeutic abortions, this implies that 99% of all foetuses with Down Syndrome are eliminated before reaching full term. A very comprehensive quality control system that must have developed over thousands of years through natural selection. The very high number of foetuses that start with Down Syndrome would suggest there is some omnipresent environmental factor to which humans are very sensitive. The Down Syndrome condition, along with other chromosome aberrations, together account for 50% of all natural miscarriages. The aberrations arise when genes on the chromosomes translocate and this is a form of genomic instability. We now know that one source of such instability is radiation. 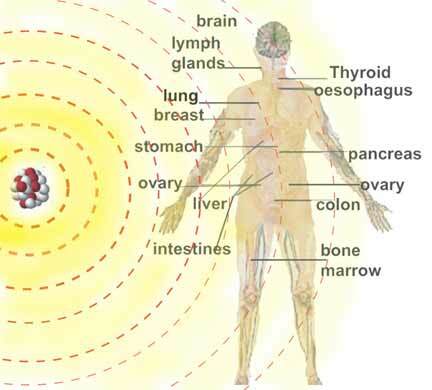 Could natural background radiation be a major cause of the Down Syndrome condition? We know that radiation levels can vary significantly at times. Gamma monitoring by the independent Argus Network over the last thirty years reveals that, under certain conditions, washout of radionuclides occurs which significantly increases radiation levels. A dramatic illustration of this phenomenon occurred several years ago when workers outside the Berkeley nuclear power station were caught in a rainstorm outside the plant and subsequently triggered radiation monitors on their way in! It was found that their clothes were covered with short-lived, naturally-occurring radionuclides including alpha and beta particles, which when breathed in, can penetrate deep into the body. 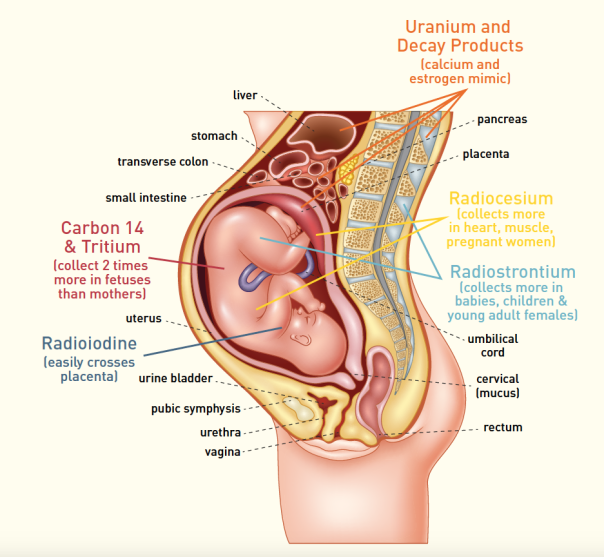 So, is natural background radiation a major source of miscarriages in women? Hardly any research has been done in this area, particularly as miscarriages are not a notifiable condition and records are hardly ever kept. So, it is necessary to concentrate purely on the relationship between radiation and Down Syndrome. In 1972, Eva Alberman reported research findings which showed that exposure to x-rays of mothers to be increased the likelihood of giving birth to a Down Syndrome child, but only at least six years after exposure. What happened when all mothers to be in Britain were exposed to an unexpected bout of radiation from the Chernobyl nuclear accident in early May 1986? Three large radioactive plumes from the accident swept south to north over the country and where they were intercepted by rain showers, significant amounts of radioactive debris were deposited. One such area was Wales, which it is generally agreed, had significantly higher levels of fallout. official figures for Down Syndrome comparing England and Wales between 1983 and 2004. In exactly six years after the Chernobyl nuclear accident, Down Syndrome levels in Wales, which previously had matched those in England, increased by about 45% over their English counterparts. This six-year delay effect exactly mirrors the findings of Eva Alberman. What about other parts of Europe? In “Welcome to Geordiestan” there are detailed facts and discussions of the health impact of the Chernobyl nuclear accident (see details below). The annual birth defect rates in Belarus, which was heavily contaminated by fallout from Chernobyl: in the most contaminated area, there was a significant jump in birth defects in 1987 and 1988, which could have been caused by exposure of male sperm to radioactive fallout. Levels then return almost to normal but in Belarus as a whole, six years after the Chernobyl nuclear accident the birth defect rate rose to four times the rate before the accident and continued to climb. The impact on the offspring due to parental exposure could be at least ten times higher via women than via men. Once again, there appears to be a six-year effect. These figures cover not only children born with Down Syndrome but all types of birth defects. One of the possible effects of genomic instability is to generate extramutated genes which interact with existing recessive deleterious genes thus bumping up the rate of birth defects. Clearly, there are many unresolved questions about the impact of radiation on the human female egg but the results from Wales and Belarus suggest that, not only very low levels of man-made radiation may have an effect, but that its genetic consequences are much higher in women than in men. Yet in the absence of any kind of research into the impact of Chernobyl and other low level radiation sources, the British government has recently announced their goal of increasing the percentage of women working in the nuclear industry to 40%. Could this have the effect of importing a genetic trojan horse into the British nation? Animal studies conducted before and after the Chernobyl nuclear accident show transgenerational effects due to radiation. Ryabokon et al. (2006) showed that, in colonies of bank voles, these effects not only persisted but increased over twenty-two generations. Genomic instability does not stop at one generation. So women of child-bearing age should seriously consider whether to work in the nuclear industry. Not only for their own sake, but for the sake of their descendants. Brain tumour day: Exposure to ionizing radiation raises concern https://www.deccanchronicle.com/lifestyle/health-and-wellbeing/080618/brain-tumour-day-exposure-to-ionizing-radiation-raises-concern.html, DECCAN CHRONICLE. Jun 8, 2018, Though a large number of brain tumours can be non-cancerous, the prevalence of brain tumour of both types is rising in the country. Chennai: Brain tumour has emerged as a type of cancer that affects a large population of youngsters mostly due to exposure to ionizing radiation. Though a large number of brain tumours can be non-cancerous, the prevalence of brain tumour of both types is rising in the country. On World Brain Tumour Day, medicos discuss various factors associated with brain tumour. Unnecessary growth of cells within a part of brain can lead to tumours namely, malignant and benign tumours. The incidence of brain tumour has been growing and statistics on childhood cancer reveal that brain tumour is commonest in girls and even in both sexes in adults in the country, though the data may vary for different states. “Every year 40,000 to 50,000 people are diagnosed with brain tumour. There are 120 different types of brain tumour and they exhibit different symptoms. People who have been exposed to ionizing radiation for longer periods have an increased risk of brain tumour, especially among the youngsters,” said Dr Suresh Kumar, consultant neurologist, Fortis Malar. After the central government introduced National Cancer Control Programme, various programmes have been launched to screen and diagnose brain tumour at an early stage, and a significant part of it emphasizes on providing palliative care in end stage. “Genetic factors are also responsible for the incidence of brain tumours, and high dosage of X-rays is also dangerous and can be a risk factor for brain tumour. Some common symptoms are seizures, headaches, blurred vision, vomiting in morning, while the patient can also have difficulty in walking, speaking and sensation,” said senior neurologist N Dinesh. Medicos usually suggest surgery, radiotherapy, chemotherapy, steroids and anti-seizure medication as few common treatments. However, the treatment can be individualistic based on the type, location, and stage of the tumour. Ionizing radiation can cause cells to turn cancerous, Pakistan Observer May 31, 2018 Islamabad : It is well established that exposure to ionizing radiation can result in mutations or other genetic damage that cause cells to turn cancerous. Now a new study led by researchers with the U.S. Department of Energy’s Lawrence Berkeley National Laboratory (Berkeley Lab) has revealed another way in which radiation can promote cancer development. Working with cultures of human breast cells, the researchers discovered that radiation exposure can alter the environment surrounding the cells so that future cells are more likely to become cancerous. “Our work shows that radiation can change the microenvironment of breast cells, and this in turn can allow the growth of abnormal cells with a long-lived phenotype that has a much greater potential to be cancerous,” says Paul Yaswen, a cell biologist and breast cancer research specialist with Berkeley Lab’s Life Sciences Division. A cell’s phenotype is its full complement of observable physical or biochemical characteristics. Different cells can have phenotypes that look dramatically different or exhibit radically different behaviour even though their genetic makeup (genotype) is identical. Signals from outside the cell can alter a cell’s phenotype by regulating (or de-regulating) the cell’s use of its genes. Studies have shown that if a cell develops a pre-cancerous phenotype, it can pass on these “epigenetic” changes to its daughters, just as it can pass on genetic mutations. Yaswen is the corresponding author of a paper describing this study that appears in the on-line journal Breast Cancer Research. Co-authoring the paper were Rituparna Mukhopadhyay, Sylvain Costes, Alexey Bazarov, William Hines and Mary Helen Barcellos-Hoff. “The work we did was performed with non-lethal but fairly substantial doses of radiation, unlike what a woman would be exposed to during a routine mammogram,” says Yaswen, who is also a member of the Bay Area Breast Cancer and the Environment Research Center. “However, the levels of radiation involved in other procedures, such as CT scans or radiotherapy, do start to approach the levels used in our experiments and could represent sources of concern.”………. There are many such women in the anti-nuclear movement. For example..
discussed in the report text. Perhaps the reason that the National Academy of Sciences does not discuss the fact that gender has such a large impact on outcome of exposure to radiation is that the causal mechanism is not yet described. The NAS BEIR VII findings show that males of all ages are more resistant to radiation exposure than females, and also that all children are more vulnerable than adults. The only radiation standard certain to protect everyone is zero. Given the fact that there is no safe dose of radiation, it is an appropriate goal. Any additional exposure above unavoidable naturally occurring radiation should include full disclosure and concurrence of the individual. It is time to adopt non-radioactive practices for making energy, peace, security and healing. ii BEIR VII, Table 12D‐3 page 312, National Academy Press (Washington, DC) 2006.
iii BEIR VII page 311, Table 12‐D 1.
vii Non‐cancer health effects are documented in classic works of John Gofman, for instance Radiation and Human Health (Random House 1982) and digital documents available: http://www.ratical.org/radiation/overviews.html#CNR and Dr. Rosalie Bertell’s classic work No Immediate Danger, Summer Town Books, 1986. 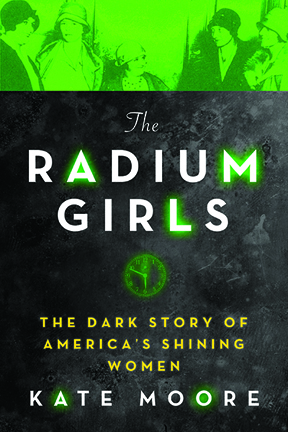 The legacy of the Radium Girls lives on through the ripples that their deaths created in labor law and our scientific understanding of the effects of radioactivity. Jacopo Prisco, CNN 20th December 2017 A century ago, glow-in-the-dark watches were an irresistible novelty. The dials, covered in a special luminous paint, shone all the time and didn’t require charging in sunlight. It looked like magic. They became known as the “Radium Girls.”. The luminous paint, which worked by converting the radiation into light through a fluorescent chemical, was one of the most successful radium-based products. By putting the brushes in their mouths, the Radium Girls were especially at risk — so why did they do it? “Because it was the easiest way to get a fine point on the brush, to paint on numbers as small as a single millimeter in width,” said Moore. When the luminous watches grew fashionable in the early 1920s, the world was already becoming aware of the risks of radioactivity. But radiation poisoning isn’t immediate, so years went by before any of the workers developed symptoms……. In the early 1920s, some of the Radium Girls started developing symptoms like fatigue and toothaches. The first death occurred in 1922, when 22-year-old Mollie Maggia died after reportedly enduring a year of pain. Although her death certificate erroneously stated that she died of syphilis, she was actually suffering from a condition called “radium jaw.” Her entire lower jawbone had become so brittle that her doctor removed it by simply lifting it out. “The radium was destroying the bone and literally drilling holes in the women’s jaws while they were still alive,” said Moore. The case, settled in the women’s favor in 1928, became a milestone of occupational hazard law. By this time, the dangers of radium were in full view, the lip-pointing technique was discontinued and the workers were being given protective gear. More women sued, and the radium companies appealed several times, but in 1939 the Supreme Court rejected the last appeal. It’s hard to calculate how many women suffered health problems due to the ingestion of radium, but the certainly number in the thousands, according to Moore. Some of the effects would only be felt much later in life through various forms of cancer. With a half-life of 1,600 years, once the radium was inside the women’s bodies, it was there for good. The legacy of the Radium Girls lives on through the ripples that their deaths created in labor law and our scientific understanding of the effects of radioactivity. “In the 1950s, during the Cold War, many agreed voluntarily to be studied by scientists, even with intrusive examinations because they had been exposed for prolonged periods of time,” said Moore. While women are leading the resistance, the halls of power in D.C. and states across the country lag pathetically behind. We saw this perhaps most vividly when Trump gathered an all-male group of politicians at the White House to discuss his efforts to gut women’s health care. In a single photograph, the gross underrepresentation of women’s voices in government and on issues directly impacting their lives was crystal clear. Educated women are the key to reversing climate change https://thenextweb.com/science/2017/08/24/educated-women-are-the-key-to-reversing-climate-change/#.tnw_mQzgoobNby RACHEL KASER — One author and activist thinks he’s found the answer to reversing climate change: the education and empowerment of women. In a talk at Singularity University’s Global Summit last week, author Paul Hawken presented an extensive plan for how to reduce climate change. Specifically, he says family planning, and the ensuing population decline would result in 119.2 gigatons of CO2 saved by 2050, the largest estimated reduction in the presentation. Educated women, he argues, have fewer children, lower mortality rates, and healthier families. Smaller families with healthier children would result in 59.6 gigatons of emissions reduced. In order to get more girls in school, Hawken proposes making schools more affordable and more girl-friendly, and also reducing the time it takes for girls to get to school. The last might seem like a curious addition, but according to children’s rights organization Plan International, school in developing countries can be a four- or five-hour walk for some kids. Parents are more likely to keep young women at home to protect them from potential attacks on the long trip. If women were to receive more education, it’s possible we might see an uptick in girls who go into STEM fields. This might also help improve climate change, if only because it increases the number of different viewpoints on the issue. As National Geographic points out, having more female researchers can help expand our knowledge base — and with it, our ability to improve on existing climate change solutions. Climate News Network 1st Aug 2017, A solar revolution is transforming the lives of women in the remotest parts of Asia. They no longer have to wait decades to be connected to a power grid but are able today to exploit the huge potential of the abundant sunshine. The highest incidence of cancer, looking across 60 years, was among those who were children when they were exposed. This is not news. The surprise is that in this group, females suffered twice as much cancer across their lives than did males. Females Exposed to Nuclear Radiation Are Far Likelier Than Males to Suffer Harm http://www.passblue.com/2017/07/05/females-exposed-to-nuclear-radiation-are-far-likelier-than-males-to-suffer-harm/, by Mary Olson • July 5, 2017 • The new nuclear weapons ban treaty, to be most likely adopted by the United Nations General Assembly this week, arises from hope for our future. The negotiations for the treaty have elevated new information about the damage from ionizing radiation to the world stage. That is exactly where it needs to be heard. Women exposed to ionizing radiation during childhood suffer from cancer at a rate 10 times higher than predicted by traditional models used by the United States Nuclear Regulatory Commission. The models assume that “Reference Man” represents us all. Invented to simplify calculations, Reference Man is 25 to 30 years old, weighs 154 pounds, is 5 feet 6 inches tall, “Caucasian and has a Western European or North American” lifestyle. There has never been a pause as more than 2,000 atomic tests since 1945 have been spreading radioactivity worldwide and hundreds of nuclear factories have proliferated. No one asked if Reference Man is an appropriate stand-in for all of humanity and radiation harm. It turns out that adult males are hurt by radiation, but they are significantly more resistant than their mothers, sisters, wives or daughters. Use of Reference Man masks gendered impacts and therefore systematically underreports radiation harm. My first paper on radiation, published in 2011, “Atomic Radiation Is More Harmful to Women,” answers a simple question from a woman who raised her hand at one of my public lectures in North Carolina a year earlier, asking, “Does radiation exposure harm me more than a man?” She did not mean in pregnancy; she meant her own body. I was shocked. That was 2010; in decades of work on radioactive waste policy, I had never heard of gender as a factor in radiation harm. I could not even attempt an answer. When the literature yielded nothing, my mentor, Rosalie Bertell, suggested I look at the numbers myself. Bertell was a mathematician and a recipient of a Right Livelihood Award, which is called an alternative to the Nobel prizes. Bertell devoted her life to communities hurt by radiation, including the ones she pointed me to in order to examine the data. Only one large data set includes all ages and both genders exposed together to a single flash of gamma and neutron radiation: the survivors of the US nuclear attacks on Hiroshima and Nagasaki in 1945. They survived in shelters or other shielding amid the first horrific years. Sixty years of data on cancer incidences and fatality among the survivors — called the Hibakusha — was published by the US National Academy of Science in 2006. I regret that this data even exists — it was my government that used the first nuclear bombs on cities full of people, and I certainly wish they had not. I nonetheless use the numbers. They hold a message for humanity: gender matters in the atomic age. That does not make it right. The difference between male and female, with males more resistant to radiation harm, is measurable in all the age-of-exposure cohorts, even into old age — the difference between genders is smaller when adults are exposed rather than when they are children. For every two men exposed in adulthood who died of cancer, three women died of cancer. A 50 percent difference in the rate of cancer death from radiation exposure in adulthood is not insignificant to most female readers! Indeed, this finding is changing my own behavior in fieldwork. The question, Why is gender a factor?, is waiting for researchers to tackle. A team lead by David Richardson in the Department of Epidemiology at the University of North Carolina, Chapel Hill, in 2016 showed that the A-bomb cancer data mirrors the outcomes of many smaller radiation exposures over time, adding up to the same exposure level as the Japanese survivors. We are all getting these smaller radiation exposures. The 10-females-to-1-male ratio cited here is the comparison of cancer outcomes from the youngest female survivors versus the 25- to 30-year-old males: the group that underpins Reference Man. This dramatic order-of-magnitude difference in biological research is like a siren blaring: pay attention! It is time to retire Reference Man. Any level that is set for public exposure to radiation should be based on little girls. When we protect them, everyone is better protected. Unless we protect girls, our collective future is at stake. The radiation and gender “siren” has not been heard widely, but it has been heard. In 2014, I was honored to present my findings at the Vienna Conference on the Humanitarian Consequences of Nuclear Weapons and exhilarated to read the draft treaty on the prohibition of nuclear weapons, where one basis for the need for the new treaty is the disproportionate harm to women and girls from ionizing radiation. The treaty falls within the jurisdiction of humanitarian law, which includes the most human activity of all: making babies, from which flow future generations. For these countless people to come, I celebrate that the news on radiation has been heard at the UN as it takes the next vital step of voting on a new nuclear-ban treaty. It is a sturdy seedling of hope.